Mobile operators offer data plans with volume caps to control network congestion and also for profit. The presence of such data caps forces many mobile users to control and limit their browsing and mobile habits to make sure that they do not exceed their data allowance. In October 2015, a New York Times article measured the bandwidth and performance costs of online advertising on 50 websites. The article revealed that “more than half of all data in those websites came from ads and other content filtered by ad blockers”. For a mobile subscriber, it implies that a large fraction of their traffic is generated simply for tracking them. What about mobile apps? How much data does an Android app generate for tracking users, app activity or printing ads? 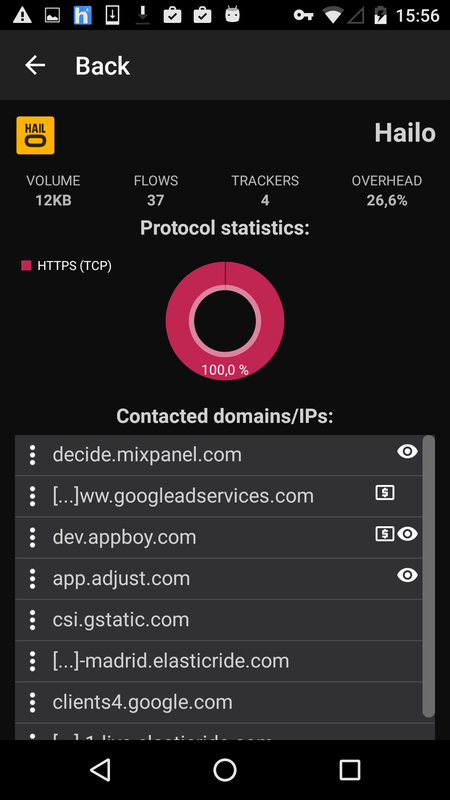 In our previous blogpost, we talked about how Haystack can help you to identify the presence of third-party trackers on your mobile apps. The large number of trackers that we have found on our mobile apps has motivated us to measure the portion of traffic that each app generates for tracking and advertising purposes. In total, we analyzed more than 1,700 mobile apps. The figure below shows the distribution of the percentage of app’s traffic going to such third-parties. The results may vary depending on how our ICSI Haystack users interact with their apps. However, the ratio of app’s traffic dedicated to tracking is much higher than what we initially expected: on average, 24% of app’s traffic is associated with third-party tracking and advertising services. This networking activity not only impacts on user’s data plans but also on the battery life of the devices. If we look in detail at the distribution, we can see that 40% of the apps dedicate at least 10% of their traffic on tracking and advertising while more than 10% of mobile apps have at least 90% of their traffic associated with such activities. If it weren’t for user tracking and advertising, many mobile apps could operate completely offline! The table below lists some of the apps for which tracking activity and ads account for at least 98% of their total traffic. The apps listed below have user ratings higher than 3.5/5 stars and millions of users. If we look at the type of apps and their targeted audience, we can see that many of them are games rated as suitable for children. These apps connect to third-party services like Facebook Graph — Facebook’s analytics and ad network –, tools for user-engagement and A/B testing like HelpShift or Optimizely, tools to promote app installs like Chartboost, analytics services like mobileapptracking (part of Tune), and mobile-game specific tracking services and gaming ad-networks like Unity3D. According to EU legislation, no tracking activity should take place on apps for children without parental consent. For some of the children games that we’ve manually tried, we have not seen any activity or information on Google Play aiming to inform the parents — or the user — about any tracking activity. Even in the USA, the FTC recently charged InMobi with a nearly 1M USD settlement for tracking children without parental consent. We will further investigate that interesting topic in future blogposts.